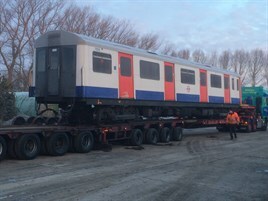 Steady progress is being made on the Vivarail project to convert retired D-Stock London Underground trains into D-train Diesel Electric Multiple Units (DEMUs), with 20 vehicles already on-site at Long Marston by the end of February. The two driving motor cars that will form part of the prototype train have been stripped and checked thoroughly for corrosion or unseen defects. “They are fine. All the old electrical equipment has been removed from under the floor so we are almost ready to start building them back up,” Vivarail Chairman Adrian Shooter told RAIL. For more on this story, read RAIL 770, published March 18. For a feature looking at the D-train project, read RAIL 771, published April 1. I live in Greater Manchester, we do not want London's 40 year old cast offs in the north of England, they will be the new pacers & just as bad. They are London's trains, let Londoner's have them. London spends in a day on infrastructure, what Manchester region gets in a year. This is grossly unfair. London is getting new trains everywhere, underground, overground, Crossrail, Thames link. Rules are produced to "prove" that the north can not have new trains. These rules are made in London, by Londoners, for the benefit of Londoners & the Southeast. The sooner the Northern Powerhouse has control of it's own transport the better. If the D-Train project succeeds in marrying compact automotive engines to generators (under the floor) and solid-state traction equipment on older EMUs – and even better, straightforwardly providing inter-carriage gangways – it would set an encouraging precedent for resolving the self-powered train shortage whilst electrification projects are unfinished. However my preference is for the majority of new upcoming EMUs to be built as IPEMUs and for selective discontinuous electrification of open sections of line not under low bridges or tunnels. The D78 stock could be used almost immediately to respond to the Southeastern Dartford lines capacity crisis caused by the (necessary) remodelling of the London Bridge area. If ‘fromthemurkydepths’ Wordpress blog is correct, the routes that serve Woolwich already have 12-car platforms throughout (except for Woolwich Dockyard). The Class 376s used, are 5-car sets. If Woolwich Dockyard station were closed (and provided with a free bus to Charlton station) until 4-car EMUs with selective door opening are acquired, all trains could run in 12-car formations. The 6-car D78s could be adapted to run on third-rail (as with Island Line’s 1938 stock) and coupled in pairs to form 12-car trains. The Class 376s could then be cascaded to Southern (via Balham) routes (10-car capable) to replace the remaining Class 455s, which can only run as maximum of 8 cars. The Class 455s could then go to South West Trains, with their own 43x ‘455/7s’ having their Class 508 trailers removed to allow more trains to be formed with 10 cars.